If you’ve followed me on social media at all, you’ve probably heard me talk about The Phoenix Fiction Writers. 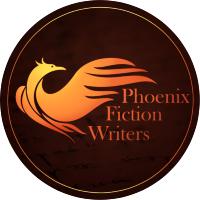 Phoenix Fiction Writers (PFW) is a collection of Science Fiction and Fantasy writers who have banded together to make the author journey easier for each other, and to provide higher quality content for our readers. One of the things that PFW provides for its readers is a monthly newsletter. This newsletter covers all our author’s releases for each month and keeps you up-to-date on all the changes that are happening both for the community itself (upcoming podcasts, new content, special events) and all the individual journeys of the authors. Basically, it’s a great place to keep informed on some truly amazing authors in the Indie Author space. And this month we have something extra special that we are putting out for subscribers of the newsletter. Our authors have been working hard and we are so excited to share The Phoenix Fiction Anthology. This short story collection has been gathered from four of our authors and offers a bite-sized example at some of the equality and diversity in our little group. In this little book we have a Myth Retelling from Kyle Roberts Shultz, a Cyberpunk from yours truly, a Dystopian from E.B. Dawson, and a Christian Fantasy from Beth Wangler. Kyle’s Greek Myth retelling, “Mythtaken”, is full of his hallmark wit, surprising twists, and endearing characters. My own short, “Stealing Life”, features a classical Cyberpunk retelling but holds on to the fast pace and characterization that I’ve become known for. E.B Dawson’s “The Government Man” takes the reader deep into a troubling dystopian future with a hard but relatable lead trapped in a hard place between loyalty and love. And the collection ends with Beth Wangler’s Christian Fiction “The Lake of Living Water” which takes the reader into an imaginative look into the world of her upcoming novel “Child of the Kaites”. It is both refreshingly beautiful and full of tension. So now you know what is in store, I highly suggest you act now! The anthology will be officially released on the ninth, and after that will be available for download immediately after you sign up for the email list.